This ghost pepper hot sauce is insane – a challenge even for those of us who love our hot sauces. So, are you ready to kick it up a notch? 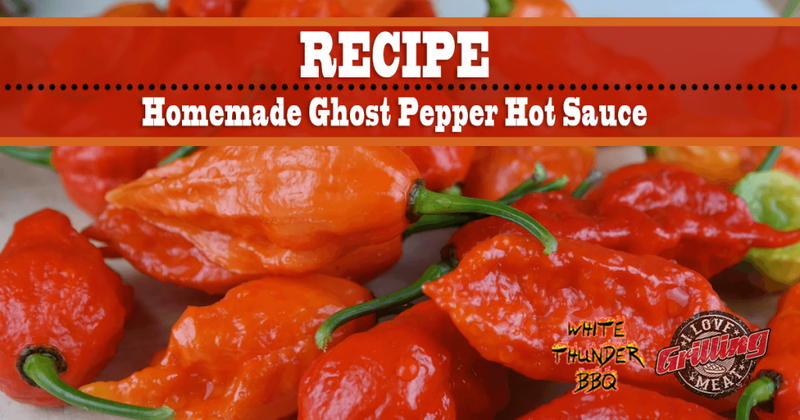 Watch the video and follow the instructions below to make your own ghost pepper hot sauce! 5 shallots, normal to medium sized. First slice the Ghost Chilies into round pieces. Leave the seeds in tact, as that’s where a lot of the spice comes from. Proceed to slice the sweet mini red chilies in half, removing the stem and seeds. Use a large jar (in which you will ferment the ingredients) to add the shallots and garlic. Add the sliced ghost and sweet chilies. Dissolve 2 teaspoons of salt in 3 cups of water. Pour the saltwater brine in the jar until everything is covered. Try to work out any air pockets. Cover the jar and let it ferment in a cool and dry place for 3 weeks. After 3 weeks have passed, pour the contents of the jar into a blender and blend until there are no chunks of anything left. Set up a pan, and heat up a little canola oil and 2 tablespoons of tomato paste. Pour the mix from your blender into the pan and bring it to a boil. Keep stirring while you add 1/4 cup of white sugar, and salt to taste. Let it simmer for a minute before adding 3 oz of Bourbon to the pan. Again, let the sauce simmer until it has the consistency you prefer. Finally, move the sauce back onto the blender. Add 1/2 cup of Cider vinegar and blend while it is still hot. Bottle the sauce immediately thereafter. How long does this keep for? Does it need to be refrigerated? Hey Ashley, thanks for dropping by! The length of time it keeps depends a lot on your process. For example, someone may not sanitize their bottles well which leaves the door opened for bacterial/fungal growth. Wish I had a more clear answer for this, however it’s really dependent on the individual’s process. Yes refrigerate it to help it keep longer.